The group Wave World operates on many levels. Basically, they are the Dutch duo of Gert van Santen and Harry Kessels who realize interesting electronic spacemusic with synthesizers and computers. 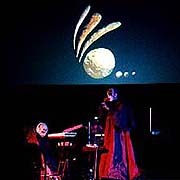 The many layers surrounding this solid musical core include live performances utilizing language and costumes portraying the inhabitants of an imaginary alien world; augmented and inspired by the wide-screen computer generated visual concepts of their third and silent member, Rolf van Slooten. 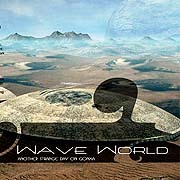 With the concurrent release of Cloudseeder and Another Strange Day On Gonxa, Wave World turns in two strong efforts, demonstrating their extraordinary musical abilities while covering the length and breadth of their sonic dimensions. Cloudseeder is a double disc which, along with several other pieces, includes two sets of music realized on the STAR'S END Ambient Radio broadcast of 10.14.01. These tracks, both in the 30 minute range, demonstrate Wave World's great ability to improvise music as well as their vision as artists. Recorded live on the air, "Star's End Part I + II - Live" were experienced by Wave World as "time in the moment". They were not recreating an existing studio composition but attempting to realize something new and unique. For the musicians, there's just the time of the performance - each interaction carries a distinct power of its own. As for the audience, we must use of minds to create an internal representation, a tonal map to keep track of harmonic space. Elsewhere on the album, coming in at over 62 minutes, the track "Nebulae - An Ambient Symphony" is a piece so long that the sense of composition disappears. Without any real beginnings or endings to concern the listener, we can enjoy the time spent with this music where ever in the piece we find ourselves. 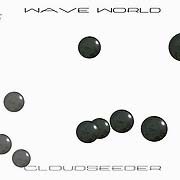 Cloudseeder goes well beyond what is expected from this heretofore primarily rhythmic and melodic based group. Throughout the two volumes, Wave World's aural explorations travel amidst the dark corners and twilight realms of smooth spacemusic. These epic improvisations work on our physical and emotional perception of time; which is mutable and does not flow at the same even rate. Alternately, Another Strange Day On Gonxa can be placed well beyond Wave World's existing works of melodic spacemusic. The mind and body are more in tune with "relatives" than with "absolutes" and this album deals with the pleasure in expectations made and met. With its rapid development, high energy and soaring synth leads, Another Strange Day On Gonxa exists out on the ill-examined border where Electronic Space and Intelligent Dance Musics meet. With tens of thousands of neurons in our brains all firing together simultaneously - in time with the beat - we naturally have a physical response to music that has a strong persistant rhythm of 60 to 80 beats per minute. If the beat's too slow, our brains can't perceive the connection between beats, too fast and our neurons can't keep up. To their extreme credit, Wave World's music is a tonic for the mind - offering the best of both worlds. They are constantly exploring, searching, navigating the breathless silence of deep space, the drama of live performance and Humanity's hardwired cravings for stimulating music.